His Democratic opponents derided him as too old for the presidency. They called him “granny.” They even suggested that he might be senile. Yet despite lingering questions about his age and his health, and largely on his reputation as a war hero, William Henry Harrison was elected the ninth President of the United States, taking the oath of office on March 4, 1841. One month later, he was dead. It can be a mistake to draw too many parallels from one historical event to another, yet the election of 1840 and the turbulent years that followed should serve as a stark reminder of the importance of every president’s first major decision, that of choosing his running mate. Harrison was 68 years old when he won the White House, the oldest president to be elected until Ronald Reagan, and the first to die in office. His successor, John Tyler, proved an ineffective and unpopular president. President Tyler was scorned and ridiculed by both parties, dismissed by his critics as “His Accidency.” He was the first president to have a veto overridden by Congress, and the first to be the target of an impeachment resolution. He was also the first sitting US president refused nomination for a second term by his own party. Tyler has gone down in history as one of the least effective US presidents, and as the first in a series of weak chief executives whose actions (or lack thereof) laid the immediate groundwork for the Civil War. The speculation and debate surrounding vice presidential picks usually focuses on electoral calculus—on efforts to balance the strengths and weaknesses of the presidential nominee, and achieve a broader demographic and/or geographic appeal. But this politicization of the decision ignores its real world consequences, for while it may be considered distasteful to dwell on the mortality of our elected leaders, history tells us that vice presidents often ascend to the Oval Office upon the death or resignation of their predecessor, and thus their qualification to serve in that capacity should always be our number one concern. Of the 38 men to have been elected President since 1789, eight have failed to complete their final term—more than one out of five. And at 72 years old, in remission from cancer for a second time (he had deadly melanomas removed in 1993 and 2000), the possibility of a President John McCain’s death or incapacitation in office is far from remote. Hopeful Americans stand in line to plunk down hard earned cash on a 1 in 120,000,000 chance to hit the Powerball lottery, yet if history is any guide, a Vice President Sarah Palin would stand a roughly 1 in 4.75 chance of succeeding John McCain before the end of his second term. Those are damn good odds for Palin. And damn bad odds for the US and the world if she is unprepared to lead our nation through our current turbulent times. Even though the DNC protests in Denver were undersized and essentially harmless, protesters in the Twin Cities planning similar protests at the RNC next week have, in the last 24 hours, been subjected to a series of appalling police raids and arrests. Journalists and lawyers present have also been detained, computers and other personal belongings seized — and all without a single illegal act being committed (by the protesters, anyway). Protestors here in Minneapolis have been targeted by a series of highly intimidating, sweeping police raids across the city, involving teams of 25-30 officers in riot gear, with semi-automatic weapons drawn, entering homes of those suspected of planning protests, handcuffing and forcing them to lay on the floor, while law enforcement officers searched the homes, seizing computers, journals, and political pamphlets. Last night, members of the St. Paul police department and the Ramsey County sheriff’s department handcuffed, photographed, and detained dozens of people meeting at a public venue to plan a demonstration, charging them with no crime other than “fire code violations,” and early this morning, the Sheriff’s department sent teams of officers into at least four Minneapolis area homes where suspected protesters were staying…. 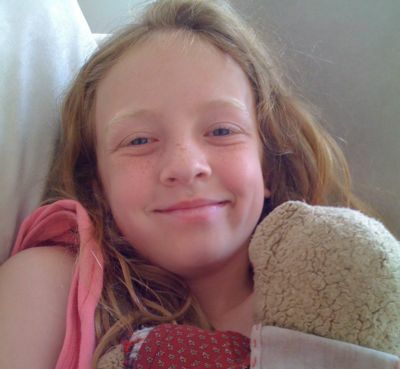 Additional reports are emerging of numerous other actions, including the ludicrous detention of a permaculture bus. Greenwald’s phrase, “suspected protesters,” says it all: protest, by definition, is being considered illegal. This is the culmination of a tactic that’s been used with increasing frequency in recent years, though never on this scale: the blatantly illegal intimidation and arrest of people planning perfectly legal demonstrations, on the theory that the inevitable lawsuits and awards are simply part of the unlimited budget being given to local law enforcement in these types of major events in order to suppress dissent. These, quite simply, are the acts of a police state. And they should inspire everyone to be less, not more, silent. Gov. Chris Gregoire stopped by the Big Tent in Denver on Wednesday to check out the “organized chaos” and take substantive questions from the bloggers. Well, not from me of course, because I lack the credibility to talk substantively, but the other bloggers, they got the Governor into some pretty good conversations. Check it out. And be sure to check out Daily Kos, where Joan has posted her own conversation with the Governor. I’ve spent the day in two odd, contrasting worlds. The first was the final leg of the drive back from Denver to Seattle, wherein (since virtually nothing else is available on the radio dial) I listened to red-meat conservatives like Rush, Hannity, Glenn Beck, Bill O’Reilly, and Laura Ingraham wax uber-enthusiastic over John McCain’s pick of Sarah Palin as his running mate. Then I got home, and I’ve been reading endless progressive blog posts and comments crowing over what a weak and disastrous pick Palin is. On this one, I think the conservatives have it right. Palin is a brilliant pick, and instantly makes McCain more competitive in a way few VP picks could have done (or have ever done in the past). Here’s why. Palin has two obvious weaknesses: her complete lack of experience and an ethics question about her (specifically) and anyone associated with the Republican Party in Alaska (more generally). Progressives are overrating both. Palin’s strong narrative as a reformer taking on Alaska’s corrupt old boy network will overwhelm her own love affair with Big Oil (the source of much of her state party’s ethics misery) and the relatively minor personnel matter she’s being investigated for. Moreover, it reinforces McCain’s own (inaccurate and manufactured) image as a reformer who’s battled against DC’s corrupt corporate culture. Meanwhile, Palin’s thin resume does help the Democrats by contradicting that line of attack on Barack Obama. But it’s a non-issue for Palin. When was the last time someone declined to vote for a president because his running mate was inexperienced? The closest recent example was Bush Sr. picking Dan Quayle in 1988, and despite Quayle’s embarrassing lack of gravitas, Poppy won. Rather easily. * She’s an extreme social conservative, someone the party base can enthusiastically mobilize around — which they weren’t doing for McCain. He just picked up a ton of volunteer energy. * But Palin’s likeable and doesn’t come off as wingnut-crazy — meaning she can appeal to low-information independents in a way that, say, Tom Coburn never could. * Her gender doesn’t just court (OK, pander to) disaffected Hillary supporters. It also negates some of the “historic” zeitgeist surrounding Obama’s campaign, because her election would be ground-breaking, too. * Her personal story is compelling on any number of levels: blue collar, working mother, part-Eskimo husband, Downs Syndrome infant (that she refused to abort), son in Iraq. 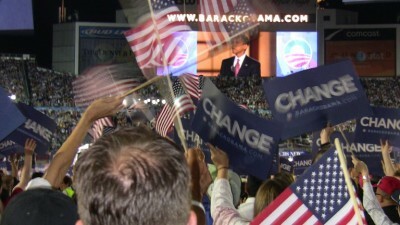 It helps counter the Obamas’ very appealing family narrative, which was on full display in Denver. As a bonus, Palin even helps lock up Alaska’s three electoral votes for McCain — believe it or not, polls had Alaska in play, between Obama’s appeal to independents and the troubles of Ted Stevens, Don Young, et al. Note that all of these attributes are about McCain getting elected — not what Palin would actually bring to the job of Vice President of the United States. She is no Gore or Cheney; she is not being expected to play a significant role in a McCain White House, the way Biden surely would for Obama. But that doesn’t matter unless you win, and McCain just increased his chances of winning in a way that picking Mitt Romney or any of the other names that were bandied about never would have. It’s easy to mock McCain for, essentially, picking a trophy VP. Except that Sarah Palin is only a means to the trophy McCain really wants. With her selection, he has served notice that Obamamania or no, McCain will continue to be a formidable candidate right through November. I’m sitting in the Denver airport waiting for my flight back, and once again struggling to obtain a reliable Internet connection, so rather than compose a lengthy post, I thought I’d just pass on a few brief notes and observation. Throughout the week folks have been asking me what it’s like to attend the DNCC, and I’ve consistently replied that while it’s an amazing experience, I kinda feel like I’m missing the convention. Accustomed to viewing these made for television events on an actual TV, I’ve felt a bit out of the loop, and totally out of touch with how the average American experienced the convention… and that after all is the experience that really counts. Attending a convention is like a attending a football game: it’s exciting, sure, but you don’t see the game nearly as well as you do at home on TV. Well, the football analogy kinda holds up for the unprecedented event last night at Invesco Field, where 80,000 screaming fans packed in to watch Barack Obama give his acceptance speech. It was like attending a Super Bowl or World Series game, only instead of a game it was about something that truly matters. There was an open area between the WA and MA delegations, behind a camera platform, which was quickly transformed into a dance floor where singing and swaying gave way to tearful hugs and back again all night long, as joyful delegates celebrated history in the making. John McCain could spontaneously burst into flames during his acceptance speech, and I doubt it would make for a more memorable political moment. There was a certain irrefutable logic to moving Thursday night’s events to Invesco Field a setting that could visually and aurally convey the unprecedented grassroots support Obama has garnered… but logical as it may have been, the DNC clearly fell down on the logistics of moving 80,000 people in and out of a highly secured location. On Thursday morning I received an email instructing me to pick up a media shuttle at 7th and Auroria, a several block walk through the midday Denver sun from the Pepsi Center, and about a mile from the “Big Tent” where we bloggers were hanging out, but when I got there, all I found was an amorphous snaking line about three miles long, and a handful of uninformed and unhelpful police officers. No signs, no guides, no volunteers… nothing. Just tens of thousands of people—delegates, press and guests alike—attempting to make their way into the stadium and a brief moment of American history. A TV cameraman told that the shuttle buses were back near the entrance to the Pepsi Center, and sure enough, a 10 minute wait in line, a ten minute bus ride, and 10 minutes through security, and I was on the field. Meanwhile, Darryl, Andrew and Garlin, who lacked the requisite press credentials slogged two and a half hours in the late afternoon heat before finally passing through security. Egress was hardly any better, as thousands of delegates and guests where channeled into narrow passages toward a chaotic parking lot where we were left to own own devices to find a shuttle bus to our final destination. Oregon legislative candidate Jefferson Smith finally took charge of the Shuttle 7 contigent, his Oregon Bus Project experience paying off for the weary masses. Democracy in action. No, thank you, Annie. And enjoy law school. Time to board the plane… more tidbits later. Sarah Palin…? I think McCain would have been better off picking Michael Palin. McCain has bet his entire campaign on his Veep pick. And the odds don’t look good. The wire services are all reporting that John McCain has picked Alaska Gov. Sarah Palin as his running mate. Leaving aside the controversy surrounding the firing of an Alaska state trooper and the possibility that this pick will bring the bribery trial of Sen. Ted Stevens, R-Internet Tubes, to the fore, I love how this brings things full circle. It’s far away and weird (a really really long way from Martha’s Vineyard) and I bet she doesn’t even have a birth certificate! And if she does it’s fake. Most Americans consider Alaska to be exotic. And cold. Very, very cold. Does anyone really think the Beltway press corpse will follow someone back to Alaska during winter break? My crystal ball is getting an anti-freeze flush, but this could go down as one of the most bizarre and disastrous vice-presidential picks in history. *Actually, I’m just lying. Bad habit I picked up in Clark County. MORE– Logically this means John McCain’s parts are now in a testicle lockbox. Did you hear that voice? Sarah Palin should make me a sandwich. Tonight at the Invesco Field I had the opportunity to sit down next to Gov. 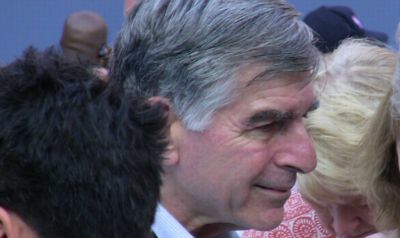 Dukakis, shake his hand, show him that picture of my daughter, and personally thank him for the campaign that made her possible. As overwhelmingly emotional as the entire night has been, that was undoubtedly my personal highlight. I’m on the field at Invesco field, but have no power, no Internet, and an overwhelmed cell phone network that keeps dropping in and out, but I’ll post as best I can… which possibly might be not at all. We’ll see. 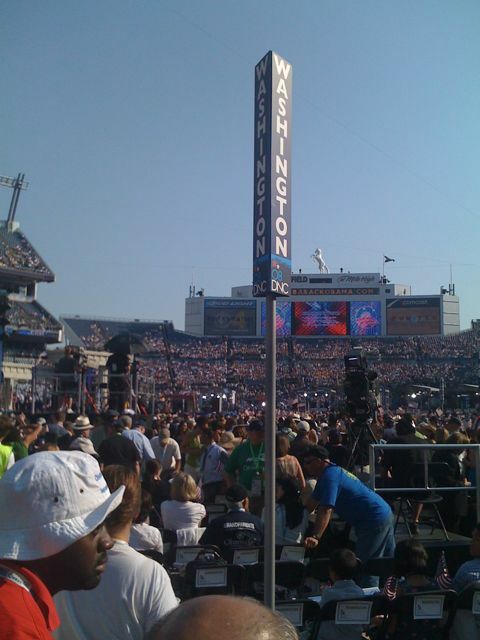 FYI, as a sure thing for Obama, Washington did not get a great location–way in the back, audience left. But at least it’s not as bad blood red state Wyoming, sitting right behind us. Oh to be a swing state. Ever wonder how FOX News host Megyn Kelly, the highest paid news anchor on television (if you’re comparing dollars earned per syllables spoken), manages to provide such insightful commentary? Clearly, it’s the endless hours of preparation. For example, even while the crowd around her loudly cheered Sen. Joe Biden following his vice presidential acceptance speech, Kelly never lost her focus or concentration. What a dedicated professional. I don’t know if the TV cameras caught it, but I couldn’t help notice Michelle Obama wiping the tears from her eyes during Beau Biden’s moving introduction of his dad. 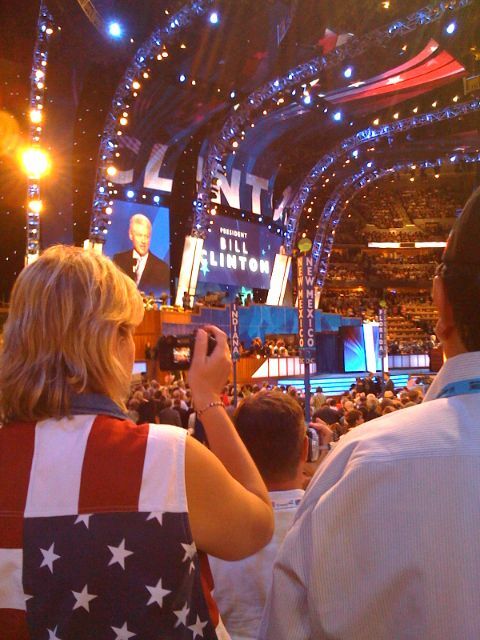 The delegates here may love Hillary Clinton, but her husband Bill just got the biggest reception of the convention. By far.